AIADMK leader and Deputy Speaker M Thambidurai told NDTV this morning that his party will support the BJP's candidate after meeting with Minister M Venkaiah Naidu, BJP Panel member on the President polls. 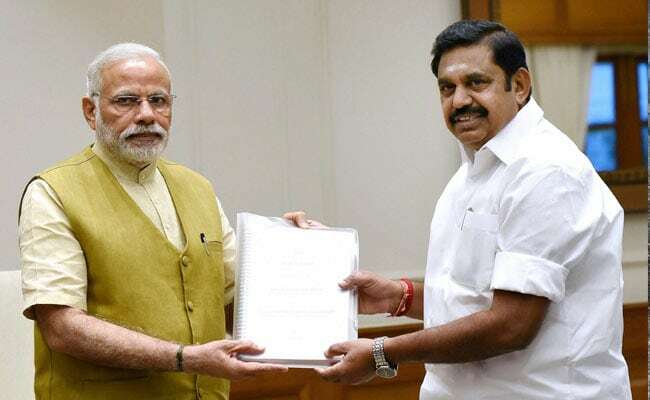 New Delhi: Just a few weeks before the Presidential election, Tamil Nadu's ruling AIADMK has pledged its support for the BJP candidate, claiming to follow the "footsteps of Amma" or J Jayalalithaa, former chief minister and the powerful chief of the party, who died in December last year. Invoking Jayalalithaa and the party's founder MG Ramachandran, Mr Thambidurai said, "Both MGR and Amma had cordial reactions with the centre... PM Narendra Modi was a good friend of Amma. Amma always voted against Congress, so we will follow her footsteps and support the BJP candidate for the President." "State government is dependent on Centre for financial assistance. After GST, Centre has to support states," Mr Thambidurai said, indicating that the Tamil Nadu government will continue to support the Modi government on most policies. Meanwhile, Union Ministers Rajnath Singh and Mr Naidu also met Congress chief Sonia Gandhi and senior CPM leader Sitaram Yechury today to discuss the election of the next President. Congress' Mallikarjun Kharge, who was also present at the 30-minute meeting along with Ghulam Nabi Azad - told NDTV, "When they have not given any names, there is no question of consensus". The two central ministers are part of the three-member team formed by PM Modi and Amit Shah to evolve a consensus on who should replace President Pranab Mukherjee. The Left is known to be keen on a token election, even though the opposition does not have the numbers. To see its presidential candidate through, the ruling NDA or National Democratic Alliance will need some help from regional parties. The NDA has about 48.5 per cent votes in the Electoral College. Regional parties AIADMK, YSR Congress, Telangana Rashtra Samiti and Biju Janata Dal together have about 12 per cent that the BJP hopes to add. It has on its team at least two allies - the Shiv Sena and the Akali Dal - who have in the past not voted for the NDA's candidate for President. The Shiv Sena twice. The rival faction of the AIADMK led by former chief minister O Panneerselvam and the YSR Congress have already offered their party's support to the NDA nominee. For complete coverage on Presidential elections, click here.